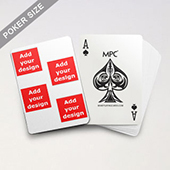 Custom poker playing cards are the perfect choice for many industries including schools, corporate sectors for advertising and marketing purposes, the retail sector for designing their own poker cards and reselling them in shops such as museums, toy and gadget shops. 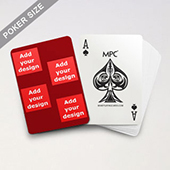 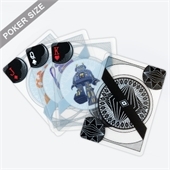 Custom poker cards measures 2.5 by 3.5 inches, a quarter inch wider than bridge cards which is more commonly used by the gaming industry but has less printable area. 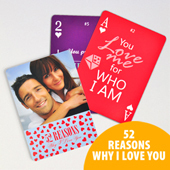 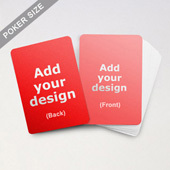 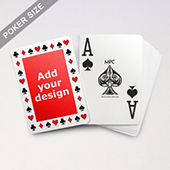 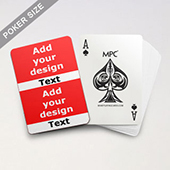 This makes poker cards the best option for personalization which inadvertently is our best sellers. Choose from a variety of differently pre-layout designs to add your photos and images onto to customize the back and face of the cards. 2 card quality options to choose from including the 300gsm which has a blue core centre layer and the 310gsm linen cards which has a black centre core layer rendering the cards completely solid and dense to light so they're not possible to see-through. 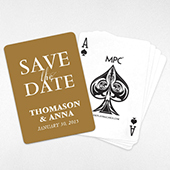 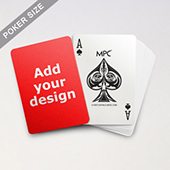 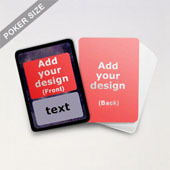 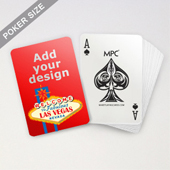 To customize your poker cards, create images that are 300DPI and CMYK color mode. 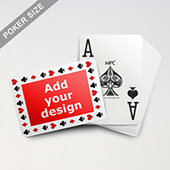 Allow bleeding area as specified in our product page. 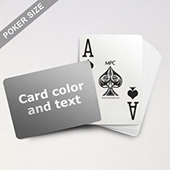 To ensure the highest quality of printing, please use high resolution images. Our custom poker card decks can be fully customized each card individually or same image on the whole deck. You can even choose to add images to different suits or numbers. 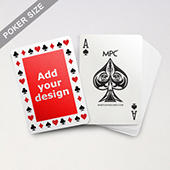 Our online cards designer is the most versatile card maker in the industry and coupled with the fact that you are ordering direct from the manufacturer, there is no middle man fee, driving the price of our custom poker cards down to a minimum. There is minimum order limit nor is there a max as our production plants are capable of producing orders of any size. 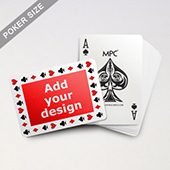 To use our online cards designer, simply upload your images and drag and drop them onto your desired cards. 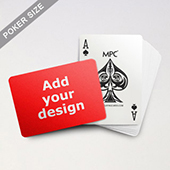 We also have an "auto fill" function to help you do this so you can literally complete your deck of customized poker cards in 1 minute. Opt to add text to your cards too with our online text editor with a variety of fonts to choose from. 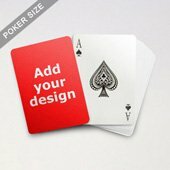 position them as you want. Our intelligent online designer will stop you from moving your text too close to the edges so that they don't get cut off while in production and also will inform you when your images do not meet the minimum requirements for a high quality print out. If you need help or want to ask more questions regarding our poker card production process, please contact our sales team who are ready to serve you. 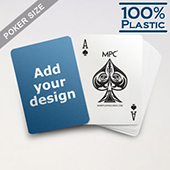 One thing you can be sure of and that is our commitment to superior quality, craftsmanship and service.